You have vanished as quickly as the summer breeze, yet you have been good to me. Your warmth and light have guided me gently back into the education I was so quickly to dread. Thanks to you, my heart has settled comfortably within the chilly breeze, and for once in my life I feel prepared. I have hit 242 followers, a number which I couldn't have even comprehended when I began writing back in January. I am aware that compared to others, this number is tiny, but to me it is perfect. Thank you, reader, for supporting me and for continuing to visit my little adventure book. I sometimes think I wasted you, September. I am obsessed with progress; the ability to be productive this month has been replaced by other things, other responsibilities. But perhaps this is for the best; what I needed to be able to reflect on myself and my own happiness. I am ready to greet October now. We do not always need to be prepared for every eventuality. I am aware of the fleeting time, but I am content to amble, to be free to walk under your empty bowers. Tartan You Glad to See Me? For me, September means not only saying goodbye to the lush, warm weather, but saying hello to university. I'm not going to lie I have never been the biggest fan of university. It is insanely difficult, often tedious and there's hardly ever any room for creativity. Also, in terms of fashion, jeans and ugg boots are pretty much the dress code. So, when you turn up to the uni bar dressed in a floppy hat and tartan co-ord, you do tend to get some looks. I suppose fashion has become my new creative outlet. I like to stand out sometimes; tis the way of the blogger! Of course, there are days dedicated to Primark cosy tights and boots, but when I can, I like to be different. This is probably my favourite outfit at the moment and I really do have to refrain from wearing it non-stop. Tartan and I develop a strong bond in the Winter months. I've also been eyeing up this hat since it came in stock and finally, when there was one left online, I bought it. I've wanted a floppy black hat for ages and this is perfect for me. The cut out hearts make it a little different, while the inside can be altered to fit all head sizes, so it's extra special! You may recognise my shoe boots from my previous post. Now that I've broken them in, they have become my staple shoes. They are a godsend. I am quite aware that I need shares in Miss Selfridge and that I should probably become their professional spokesperson/model/PR person (feel free to let them know this ;)), but I did buy something from Lipsy the other day so I'm not completely insane. I may make university sound incredibly dull, but there are positives. Outside of lectures and seminars, I have show choir which I love and this year I am aiming to do some kind of solo performance at one of the events. Like anything, we must all focus on the positives. Stay beautiful, everyone. Timothy jumped, his heart in his head and his glasses slipping down his nose. Stumbling over his own briefcase, he pushed them back up his nose and stared back at the murky water which piled high like fog behind the glass. Shaken, he desperately attempted to murmur something again. But he had forgotten to breathe and all that emerged was a nonsensical spluttering. But the creature in the tank was listening. The water ricocheted back off the glass like an internal current, making the tank shudder as though it would give way. “Maybe that’s what you want...” Timothy whispered, his eyes fixated on the spot where the monster inside had shocked him before. He pricked up his ears, listening intently for any kind of sound, but anything in the water had ceased movement; his quickening heartbeat the only thing ringing in his ears. A cruel idea crept into his mind. An idea that could get him killed, or worse, fired. He trembled to think of the reaction he would receive if he came home without a job. He raised his hand, formed a fist and gently touched the cold pane. The creature hit the glass so hard that it cracked and Timothy felt his body surge as he hit the floor. He looked up and gasped. Her shimmering, sad eyes met his own and he was immediately entranced. It was a woman. But it wasn’t. Her skin was smooth and pale, her lips glittering under the light of the halogens. She had her fingers pressed to the glass, her hair swimming circles around her skull. As he arose, he rose his hand again, slowly moving it towards the glass. She stared at it as it got closer and closer. But when barely a finger tip had made contact, she vanished back into the dark, her glistening fish tail slipping away behind her. I'm well aware that perhaps the pictures don't really match up to the darker style of the story, but I really wanted to write it and there's hardly anyway for a girl to get a hold of a human-sized fish tank nowadays. Ridiculous, right? I made this post because I love shimmers and sometimes when I apply them they remind me of the glittering scales of a mermaid's tail. So I imagined what I thought a mermaid's makeup would look like (provided that under the sea cosmetics stores are a thing. Fins? Superreef?). I knew I wanted to make a natural, pale look, as a mermaid is, after all, a mythical creature, associated with the natural sea. I also suppose she wouldn't spend too much time in the sun. I started by applying the Laura Mercier Foundation Primer to my nose, chin, forehead and around my eyes, to even out skin tone and to create more of a glow, followed by the Collection Lasting Perfection Concealer in 'Fair' in these same places. For my eyebrows, I use Benefit's Browzings to naturally shape my brows. Next I brush the Bourjois Poudre De Riz De Java all over to set the base. Lastly, I dust the Revlon Powder Blush in 'Racy Rose' over my cheekbones up to my ears. Onto the most important part...the eyes. I use the first highlighting shade from my Makeup Revolution Iconic 3 Palette under the curves of my brows and in the corner of my eyes, followed by the Bliss Eyeshadow from Ofra. This is pretty much one of the most beautiful gold shimmers I have ever used, and I use this all over the lid up to the brow. On just the lid, I use the 6th shade from the Iconic 3, which is a coppery shimmer. The last eyeshadow is the Marsk Mineral Eyeshadow in 'Foiled Again', which is a vibrant loose glitter powder. Because you need so very little, I used my finger to apply along the lashline and create a gradient upwards...like waves if you will! I chose the Vintage Cosmetics Company's False Eyelashes in 'Gracie', mainly because of the way each individual lash separates. I think there is something mystical about them; they're natural but mythical at the same time. On my lips is the L'Oreal Collection Privee in 'Barely Golden'; one of my favourite all time nudes. The gold undertone goes beautifully with all the shimmers. As a professional mermaid princess wannabe, I hope I made you proud with my interpretation. I wanted to create a fairy tale look that could be worn all day, even on the land where fins are less compatible. I know that it's better down where it's wetter, but I guess we all have to make compromises, am I right? After cancelling my last beauty box subscription, giving them another chance with their makeover and then finding my account had been deleted, I decided it was time for a change. I had been anticipating the arrival of My Little Box in the UK ever since Carrie of WishWishWish wrote of her visit to the offices in Paris. Immediately, I was hooked. To be honest, I was starting to grow a bit bored with receiving just beauty products every month. Sure they were nice, but as a girl with a very specific and narrow taste in beauty, I was finding that the majority of the products I was receiving were just getting in the way. My Little Box is just a little bit different. Packaged in possibly the most gorgeous way possible (it's like they know exactly what I love & turned it into a box), My Little Box contains lifestyle, beauty and style products every month, along with their magazine My Little World (which I didn't receive in this box but I'm assuming that's because it's the first one), as well as unique, illustrated goodies. The packaging was just so perfect and beautiful that it was quite the emotional moment untying that sweet ribbon. The first little surprise was the illustrated card with a lovely quote from Maureen Johnson on it. I hope to get more of these little pieces of inspiration, as it has now been placed on my wall of pictures at the back of my desk. I then received some adorable Paris themed stickers which are so cute and I will definitely use on notebooks and people's birthday cards. This sweet notebook was next up, with the first few pages dedicated to explaining the history of the company, and then the rest are blank for creative exploration, I'm sure. It's a really good quality notebook with a hard cover. On to the beauty products! These three lovelies came in the sweet little bag which I absolutely LOVE. I'm not quite sure how I will reuse it yet, so leave some suggestions in the comments as to what I can use it for! Laura Mercier Foundation Primer - 30ml Sample Size - (RRP £29 for 50ml). I've heard a lot on the grape vine about Laura Mercier products, with many a blogger raving about this one in particular. I don't wear foundation myself, but I will definitely be using this for concealer and eyeshadow. It's also a seriously decent sample size and will last me for ages. My Little Beauty Complexion Brightening Pen - Full Size - (RRP £11). This will obviously be my first experience using the My Little Beauty range, but I am so excited. The packaging is super pretty and is supposed to brighten up your skin. It can also be used as a primer, so this was a seriously primer orientated box, but I will definitely be using this on my dark circles. Nuxe Huile Prodigieuse - 10ml Sample Size - (RRP £28 for 100ml). This is another product that I think I will definitely use, as it's basically a moisturising oil for face, skin and hair. I'm curious to see the effect this will have on my hair and it can also be used in the bath for added luxury. The last product I found was this polka dot laptop cover. At least I think it's a laptop cover. I think it can be used for pretty much anything, but personally I will be using it to keep my university bag more organised, as my laptop is too big for it. I think it's a super sweet idea though! I am completely converted to My Little Box. Everything is so wonderfully considered and thought through and I love how much care has gone into the pictures and product choices. For £14.95 a month (including P&P! ), a different box with it's own unique theme will be delivered right to your door! The only downside is that this has left me lusting to visit Paris. Take me there soon, fate! This is quite a long time coming, considering I have been watching beauty bloggers for years on youtube and wishing I could be as cool as them. But the honest truth is, I am pretty cool! 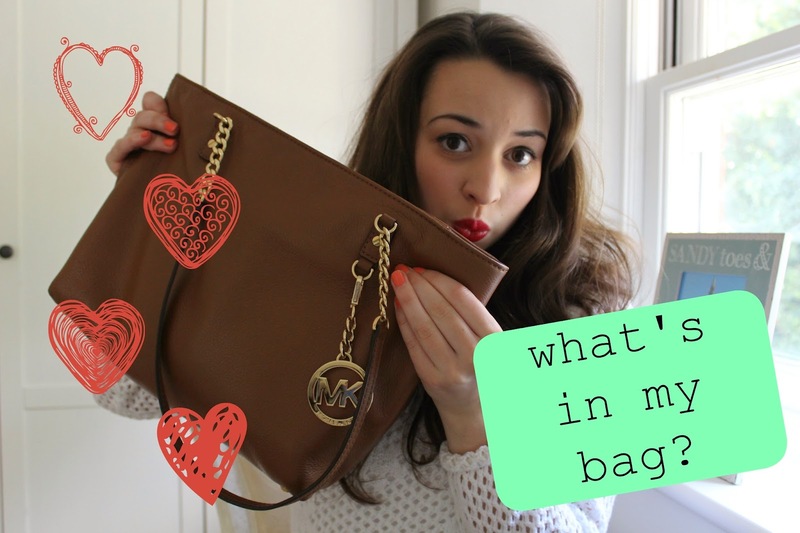 So yesterday, I filmed, edited and uploaded my first ever Youtube video. I started with something quite simple and fun; a What's in My Bag tag. Being the nosy parker I am I love having a sneak peek inside somebody's bag, so I thought I'd repay the favour! I'd absolutely love for you all to give it a watch and to subscribe to my channel. It's unlikely that I will promote every video on my blog, as I'm hoping to keep the two separate, so the best way to find out about new videos is to subscribe! As I'm only just starting out every little subscriber helps and I really appreciate any support! What I discovered were possibly the best smelling little bath bombs in the entire flipping world; Wild-Olive Bath Sundaes. Not only do they smell flipping amazing, but they are positively adorable to look at. They also come in tons of different scents so there really is something for everyone. The three scents I chose were Tuberose, Wild Honeysuckle and Peony. If you know me, you'll know I love anything that smells like fresh flowers and these three smell just like the real thing. When you dip in the bath, its like you're in a field of floral wonders. They are also quite strong smelling, so it isn't really even necessary to use a whole one for one bath. You can crumble bits off as and when you need them...which is still quite painful because they are so pretty to look at! Or you can throw it all in at once, I'm not gonna stop you! They also don't break the bank, costing only £2.25 a pop. I love the idea of giving these as a gift as well. I bought these at Down Swan Street in West Malling, which is the cutest little gift shop ever. There, if you buy six, you get a free purple egg carton which they slot into perfectly, so you can give them as an adorable present! This is also available as an option on the Wild-Olive website. I absolutely love the concept of these, mainly because I've never seen anything like them before. Wild-Olive also do other products such as soaps, reed diffusers and my all time favourite CANDLES. So I absolutely cannot wait to try more from them! Last week, I went to keep my mama company in Kent. I hadn't spent so long away from Brighton in a while, so it was strange to come home to my old home and get away from everything for a little while. One of mine and my mama's favourite places to go is West Malling, because it has the prettiest high street. Full of independent shops and cafes, you could wander around for hours poking your head in and sampling all of the treats. Now, I've reviewed the Swan Street Cafe before for breakfast, but I was eager to taste their lunch creations. We began with drinks. My mama had a large cappuccino, which is a brilliant size for a coffee I can tell you. While I had a peach, papaya and strawberry smoothie. It was incredibly refreshing, but don't expect it to be too sweet like I did! It has an edge to it. We both had jacket potatoes, which doesn't seem like the most exciting kind of food ever, but I am a huge fan of the classic. I had my favourite topping; tuna mayonnaise. I'm not sure what they put in it but it had an incredible flavour, nothing like any tuna mayo I've tasted before. Mama had homemade coleslaw, which again, tasted incredibly different from your regular old coleslaw. It was delicious! (And I seriously don't even like coleslaw). I've used the word coleslaw way too many times in this paragraph. They have a load of recipe books on the side in the cafe, which I began to skim through. I'm now incredibly tempted to make snow meringue icing. I can tell you though I've never had such weird looks given to me as when I was trying to take a portrait photo of a book page in the middle of a busy cafe. Whenever I go to West Malling there is one place I always want to visit; possibly my favourite sweet shop in the world with the absolute best name in the world; Chocolate Umbrella. I think I love it so much because it reminds me of a muggle version of Honeydukes, which is good enough for me! The walls are lined with jars upon jars filled with a rainbow of different candies, gummies and bon bons. Their displays are also beautiful, covered in homemade gifts like sweetie cakes and party bags. The best thing about this place is the price as well. Everything is so reasonable and therefore the perfect gift! Better than shoes, eh? Hmm...we'll see about that! The teenage version of me got jittery over the Equestrian themed chocolate set. They also have cabinets filled with a glorious pick and mix range of bite size chocolates and truffles, just waiting to be tasted. As well as colourful chocolate slabs...like tasty broken glass. That's a weird comparison. Don't eat glass, kids, just chocolate. I resisted the urge to buy everything the store, however I will be going back soon to get some Christmas presents for people! The last shop we went into is also one of my favourites, where I found these. Last week, my boyfriend's sister came to stay with us in Brighton. It was the week when the summer days were lingering on their final threads and the air was growing chilly. The transition to Winter clothes is one I hate. I am naturally a very cold person, so enduring the plummet of my body temperature to ridiculous levels isn't something I'm happy with. I hate layers and I hate the cold sweat that clings to me when I wear tight fitting wool. I also suffer from the newly (and artificially) diagnosed disease of dress-up-itis. It's where you loathe jeans to such a degree that you feel the constant desire to wear all the lovely clothes you own. These two issues usually end up with the clashing result of "I don't want to be freezing in pretty clothes but I don't want to wear jeans." The result; you go to Cineworld looking like you should be going out for dinner. This outfit was actually inspired by my friend and work colleague Amber (whose blog you can find here). She posted an instagram picture of herself in the pink version of this jumper with a pencil skirt and I instantly put this outfit together. I think a pair of black shoe boots are a necessity for Winter. Comfortable and versatile. For some reason, even though I got these in store only a week ago, they aren't on the website for some reason. So there are similar ones here and here. Satchel from New Look (Kelly Brook's range). Sadly this beautiful bag is no longer available. I'm not going to lie, I've actually hated pencil skirts for years. They've always seemed too formal and rigid, like something you have to wear to an office. But since my mama introduced me to them (like basically my entire wardrobe), I have been converted. I now own this one, a peach one and a tartan one, both of which can go with nearly every top I own. The fluffy jumper just screams Autumn, although I'm not ready to let go of the light evenings just yet. And, of course, nothing finishes an outfit like a Disney themed necklace. It always brings me a bit of joy when I discover a Winter outfit that I love and keeps me warm. If you were wondering, we saw Guardians of the Galaxy, which is pretty much one of the best Marvel films I've seen in a while. I also cried within the first five minutes of it starting. Don't judge me. Well, 'How to Gap Year' the Hello Miss Jordan way. When Allie asked me if I'd like to do a little collab about our gap years, I thought it would be a unique chance to let you know what I did on my gap year, and that, no matter what you may be told, there is no right or wrong way to have a gap year. My gap year took me down an entirely different path from what was planned. As of August 2012, I was all set to go to the University of Birmingham to study English with Creative Writing. It was my second choice of university after being devastatingly unsuccessful to my first choice, Nottingham. I made the best of a bad situation and went to Birmingham. It was all looking good. I had my first choice of accommodation, I loved the course...but there was one thing that I hadn’t expected. Love. It slapped me right in the face. Actually, even that’s a lie. I actually wasn’t in love, but I was very heavily in ‘like’. I deferred my course because I started dating a boy who lived in Brighton. It wasn’t necessarily going anywhere and it was a huge risk, but the more I think about it now, I was never ready to go to that university. If I had been, I wouldn’t have taken a gap year. So I did it. I rang Birmingham and I was officially a gap year student, although not in the traditional sense at all. I was taking a gap year in love. Two days after deferring, we broke up. Three days after that, we got back together. A month later, we admitted we loved each other. Six months later, we were living together. It slowly became worth it. And as we fell more and more in love with each other, the prospect of ever attending a university so far from home and from him seemed foreign. I tried to block it out, but I couldn’t. If I ever wanted to go, I had to make the decision at that moment. So in November 2012, I rang Birmingham once more and told them I was abandoning my place. And then, in a series of events, I contacted my old head of year, told him I was reapplying and he sent me into the UCAS system once more but with completely different options. This time, Brighton and Sussex. I honestly thought I was going to Brighton. I put Sussex down as almost a backup option because I had spaces left. When they sent me an unconditional offer I was floored and accepted. So from Birmingham to Sussex was my journey, all for love. And I am so glad I followed my heart and did it, because (spoiler alert!) we have now been together for two years. I think it was meant to be all along. I now can’t imagine living a good three hours away from my parents, and Brighton is so close I can see everyone I love whenever I want. It wasn’t easy, I ended up in a job I hated for the second half of my gap year and had to stay until early this year, but I have now escaped and am living happily with my boyfriend in our own house. So I didn't go travelling. I didn't 'find myself' and I certainly didn't gain a whole new insight into the world. I did receive a lot of snide remarks saying, "Oh, I heard you dropped out of uni", like it was some kind of dirty mistake I had made. If what you do on your gap year is something YOU want to do, then it's not a mistake, it's an investment. I've just happened to invest in love. You can read about Allie's gap year experience here, and it's very different from mine! The next morning, we awoke to rolling grey skies and chilly air, but our spirits weren't dampened. If the previous day hadn't brought us enough food, we had a two course breakfast to look forward to.